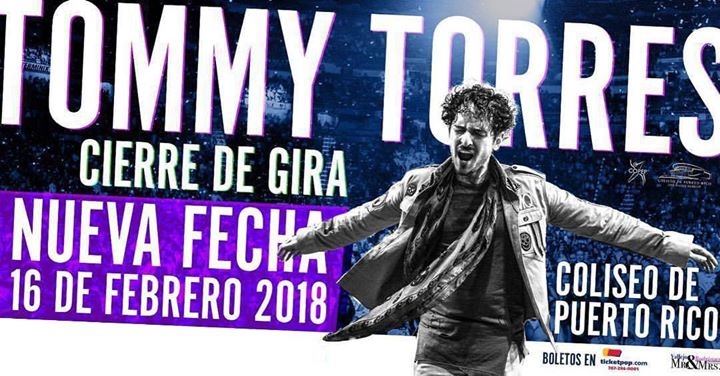 NEW DATE: Tommy Torres concert event scheduled for Saturday, November 11 at Coliseo de Puerto Rico has been postponed for Friday, February 16, 2018 at 8:30 pm. Tickets for the previous date, will be honored for the new date. VIP: VIP ticket includes Meet & Greet for photo with the artist in addition of the preferential seating in front of stage. Tommy Torres in Tú y Yo Tour on Friday, February 16, 2018 at Coliseo de Puerto Rico.